Momma Told Me: It never hurts to try something new. My readers know our family is full of early adopters. If we see something new that adds a level of deliciousness and convenience to our everyday hectic lives we try it. 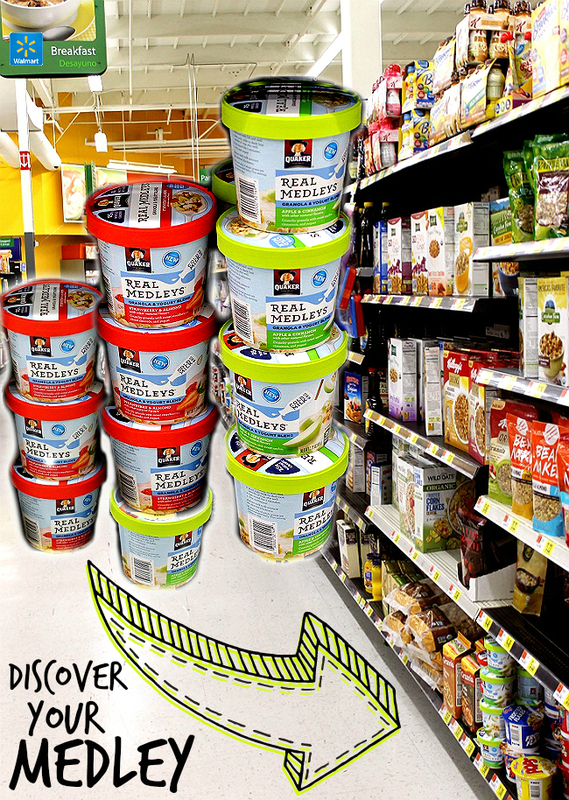 When we discovered new Quaker® Real Medleys® Yogurt Cups at an in-store demo, while shopping at our local Walmart, we jumped at the chance to sample this exciting shelf stable revolution. Available in 3 delicious flavors, Strawberry Almond, Apple Cinnamon, and Raspberry Pecan, Quaker® Real Medleys® Yogurt Cups are a one of a kind shelf stable breakfast option that combines some of our favorite breakfast ingredients; yogurt, granola, and real fruit. Of course, hearing that there was a single serve breakfast option full of 25g of whole grains, 10g of protein, real fruit and nuts, brought out the skeptic in me. Sure, I add granola to my yogurt cups and fresh fruit to my cereal, but having all of my favorite morning textures, flavors, and experiences in one convenient cup? It's possible when you add 1/2C of cold skim milk to Quaker® Real Medleys® Yogurt Cups, stir, let sit for 2 minutes, then enjoy. That first bite of Apple Cinnamon, standing there in my local Walmart, was crunchy, cool, yum! I was immediately inspired to whip up my own Quaker® Real Medleys® Yogurt Cups pairing- Apple Roses to enjoy alongside my favorite new breakfast and snack. 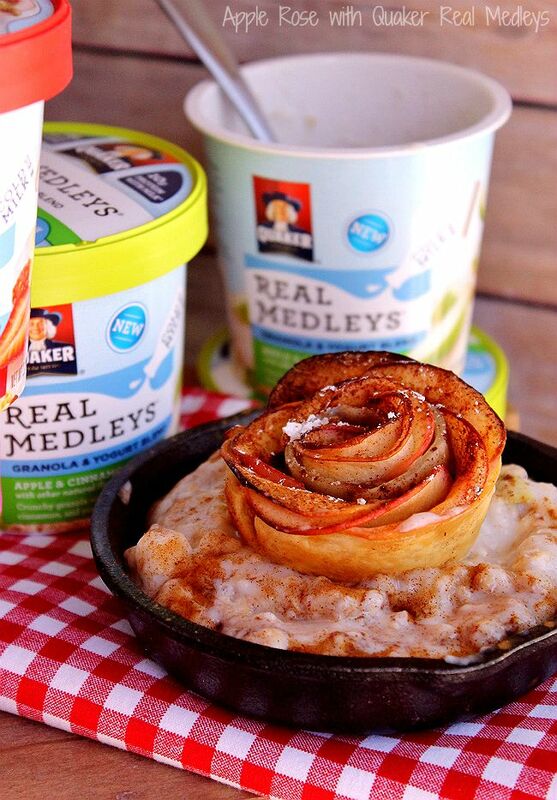 Making satisfying, beautiful, baked Apple Roses, are almost as simple as preparing a fresh cup of Quaker® Real Medleys® Yogurt Cups. 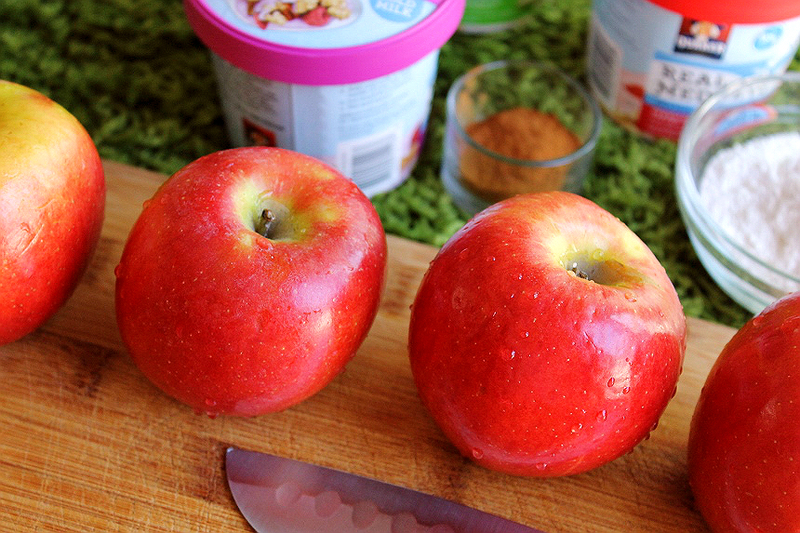 Start by halving a few of your favorite baking apples. While I prefer the flavor and taste of Granny Smith's you will most likely want to reach for Honey Crisps or Pink Ladies. The redder the apple, the more dramatic an effect you will see on the 'petals' once baked. 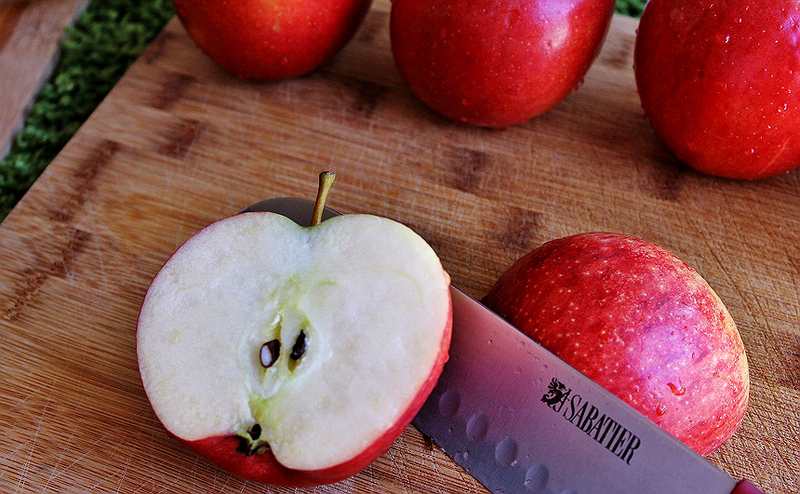 Next you will want to core your apples, quarter them, and slice them extra thin. 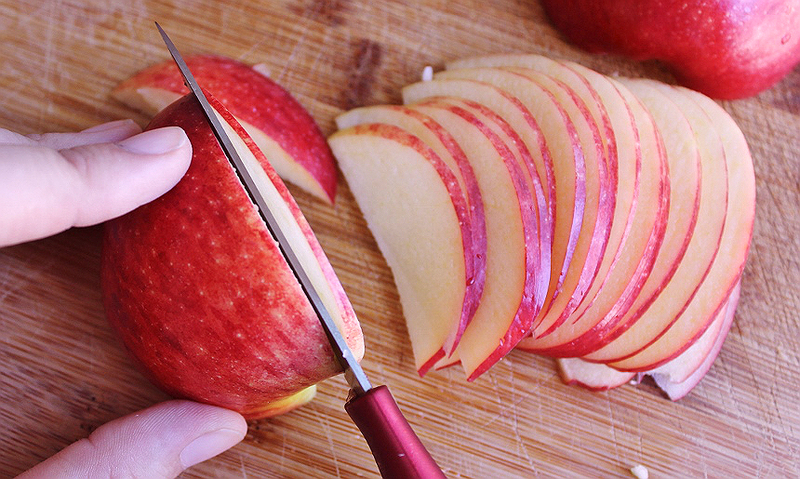 If you have an apple corer you can get through the first few steps at once, and a mandolin can help greatly to form quick, even, slices for your apple petals. Place your apple slices in a prepared bowl of water and lemon juice, to prevent browning, and send them to the microwave for 3 minutes, on high, to help soften the apple slices for rolling. You are not trying to cook them, simply make them more pliable for the following steps. 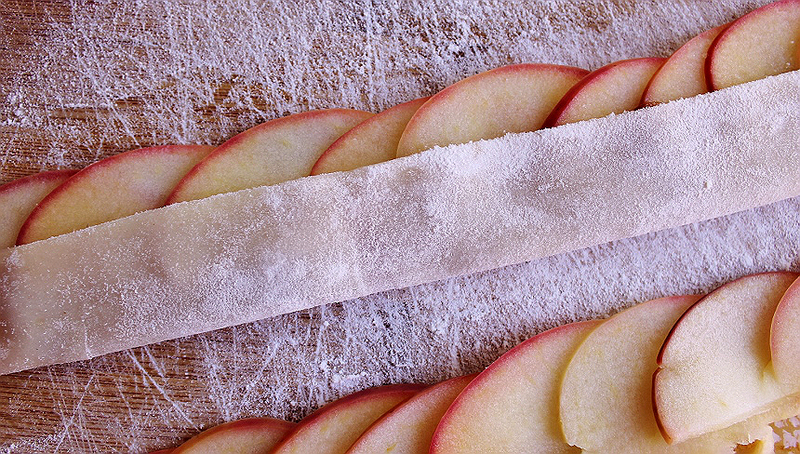 Drain your apple slices well and prepare a dry, well floured, surface to work on. Cut a pastry shell into rectangular strips about 9" x 2.5". You may wish to roll the pastry shell out before cutting, as a thinner pastry will make for a less bulky rose in the long run. 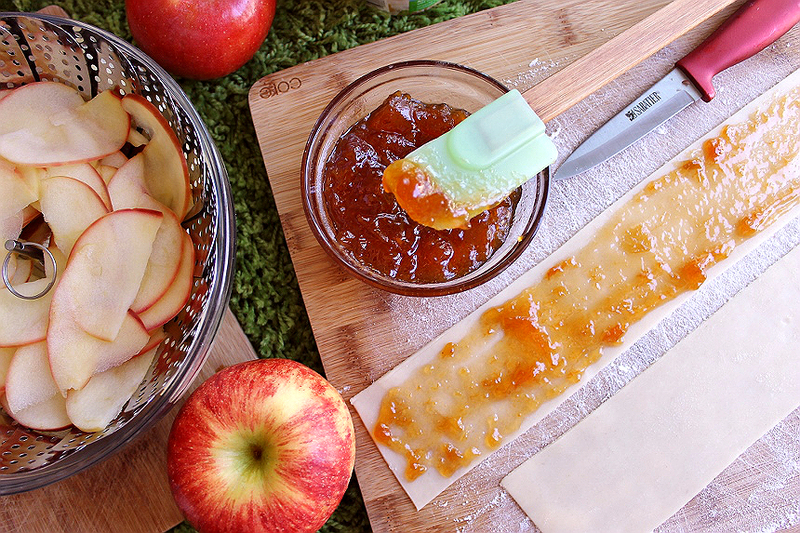 Spread your preserves of choice (we used apricot) along each strip of pastry and lay apple slices along the top half of each strip so that they overlap halfway and are hanging off the top of the pastry shell about halfway as well. Fold the bottom of the pastry shell up, and in half, so that the apple slices still peek out about half their height. Next, begin rolling inward, from one end, until the entire apple/pastry layer is rolled into a blossom. You may wish to take some extra preserves and adhere the lose end into the outer side f each blossom. 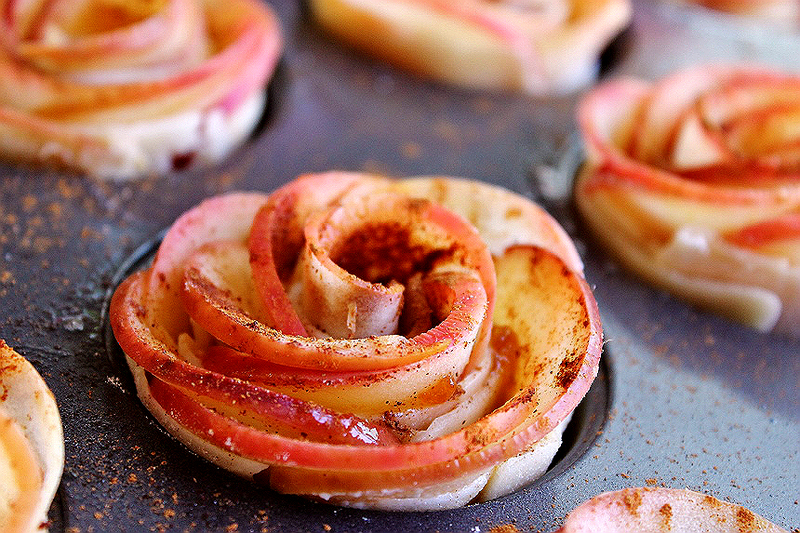 Place your apple roses in a silicone cupcake pan or a well greased traditional muffin pan. Sprinkle the tops of your roses with some cinnamon. You may lightly baste the tops with a butter mixture if you desire a crispier skin/finish. Place your roses into a pre-heated oven, at 375F, for about 25-28 minutes, or until the apples have begun to turn golden brown along the edges. Apple roses make a wonderful garnish to any holiday pie or tart and can be enjoyed fresh from the oven a-la-mode, or cold alongside your favorite Quaker® Real Medleys® Yogurt Cups as part of a satisfying and delicious breakfast. I like to make 6-8 of these at a time and store them in the fridge for days when I am running short on time in the mornings. Much like the concept of pairing granola, fruit, and yogurt in a single shelf stable cup- apple roses look elegant and sophisticated without the trouble and fuss. 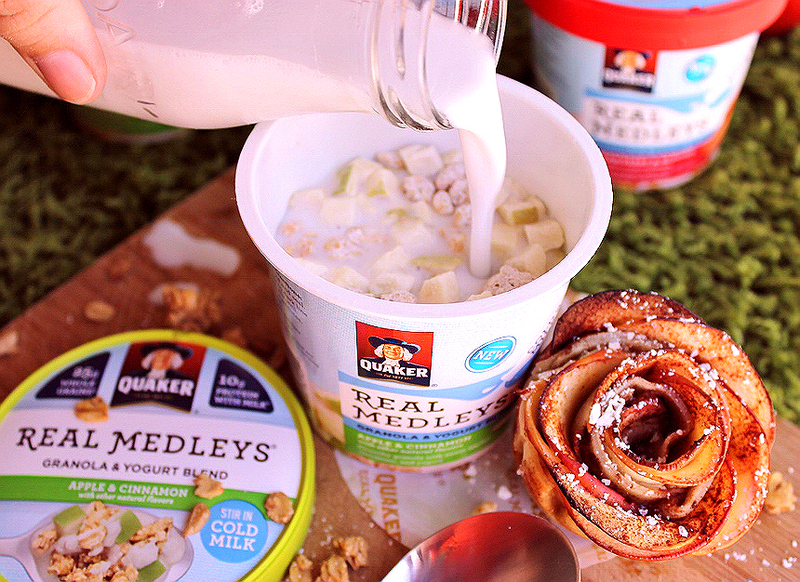 Anyone can make these baked apple roses and anyone can enjoy a cold, delicious, Quaker® Real Medleys® Yogurt Cup when they add 1/2 cup of refreshingly cold milk and stir. The two paired together create a breakfast experience unlike anything you've experiences before. 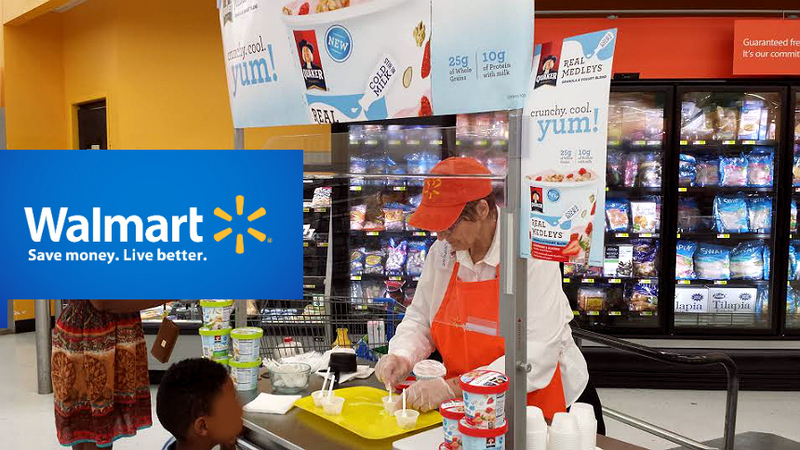 If you haven't been lucky enough to discover new Quaker® Real Medleys® Yogurt Cups through an in store demo, you can find all three varieties in the cold cereal aisle of your local Walmart. These satisfying and unique yogurt cups will be on the shelf with other ready-to-eat breakfast solutions- absolutely no refrigeration necessary. As long as you have cold milk waiting in your fridge at the office or home, you're ready to experience this one of a kind treat. I guarantee there's been nothing like this before! Of course, this all begs the question, where have Real Medley's been all my life? I can still remember the late nights, turned early mornings in college where I forked over $5+ dollars for a coffee house parfait that had often gone mushy. Quaker® Real Medleys® Yogurt Cups not only pair some of my favorite breakfast and snack components, but somehow manage to let all of the textures and flavors shine uniquely on their own. From crunchy delicious whole grain granola and nuts to soft, crispy, real fruit pieces and satisfyingly cold yogurt; all in one easy to grab, add, stir, and enjoy cup! We're going to share the complete recipe and step by step process for creating our perfect Real Medleys pairing down below (and don't forget to grab our PIN strip.) For now, I want to hear if you've tried these new delicious breakfast solutions and what kind of flavors you'd like to see next. At the risk of sounding vanilla, I'd love to see a Peaches and Cream Quaker® Real Medleys® Yogurt Cups hit the shelves, or even a seasonal Pumpkin Spice with cinnamon and almonds-YUM! Tell me, how would you enjoy your Real Medley moment? 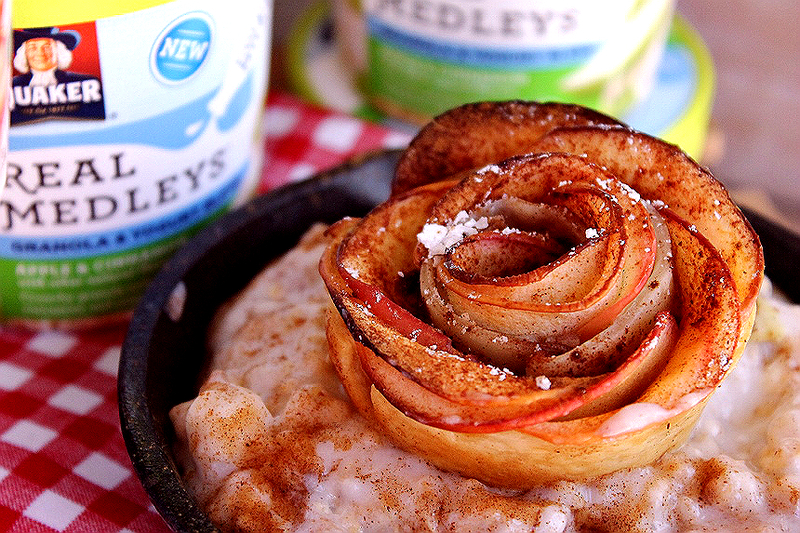 Follow Quaker on Facebook and Pinterest for more inspired Real Medleys pairings! 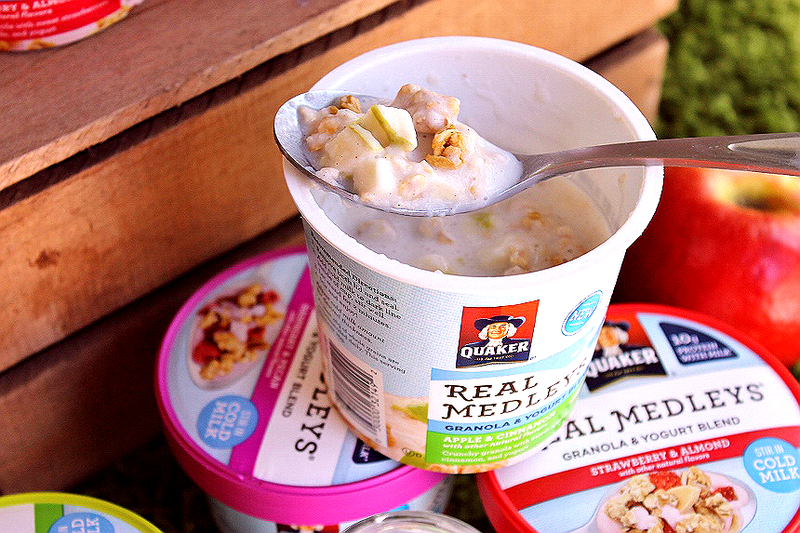 What Daughter Says: Experience the crunchy, cool, yum way to enjoy breakfast with Quaker® Real Medleys® Yogurt Cups. Looking for more Quaker® Real Medleys® Yogurt Cups pairing ideas? Download the Blippar app from your Apple or Android store to scan your package and receive information tutorials on Quaker® Real Medleys® Yogurt Cups. *click for printable Apple Roses recipe. 2 Pastry Shells, Rolled Flat and Cut 9" x 2.5"
1. 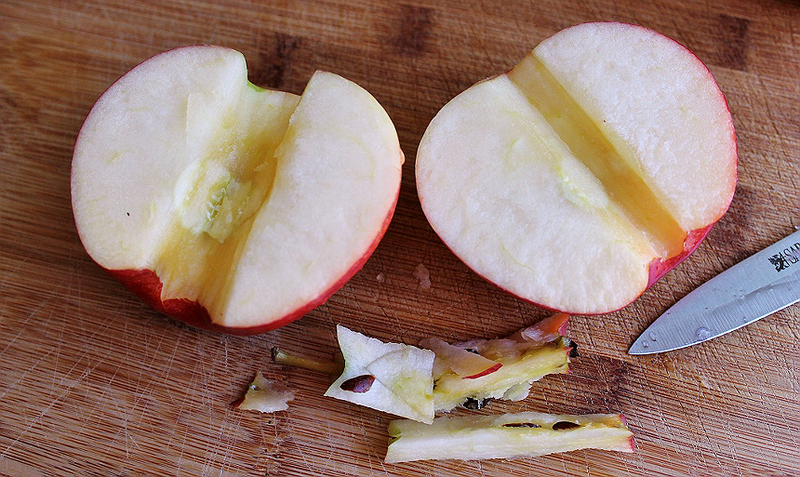 Slice apple quarters thin and even and place in prepared lemon water bowl. 2. 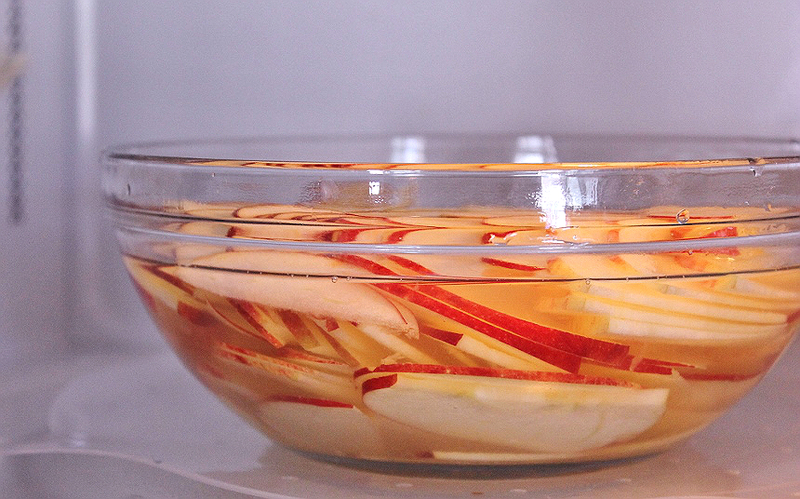 Microwave apple slices in water for 3 MINS on high. Drain. 3. Spread preserves in a light layer along pastry strips on a flour dusted surface. 4. 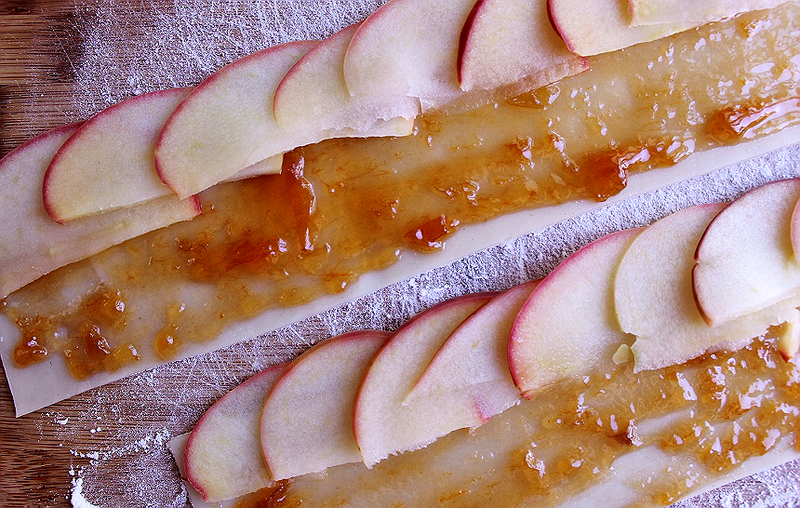 Arrange drained apple slices so that they are halfway off the top of the pastry strip, and overlapping each other by half. 5. 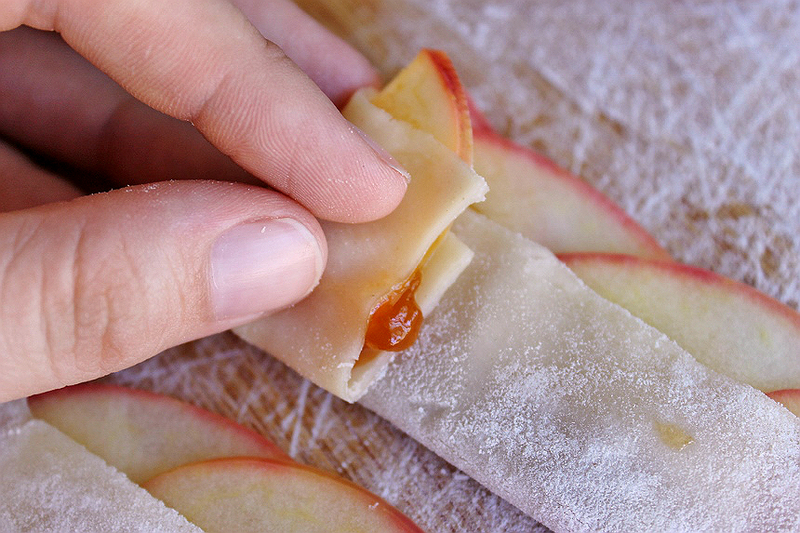 Fold the bottom of pastry strip up, in half, so that half of the apple slices are peeking out of the top. 6. Gently roll from one end, left or right, in until a blossom effect is created. Daub leftover preserves on any overlapping pastry to secure for the baking process. Sprinkle cinnamon across the tops. 7. 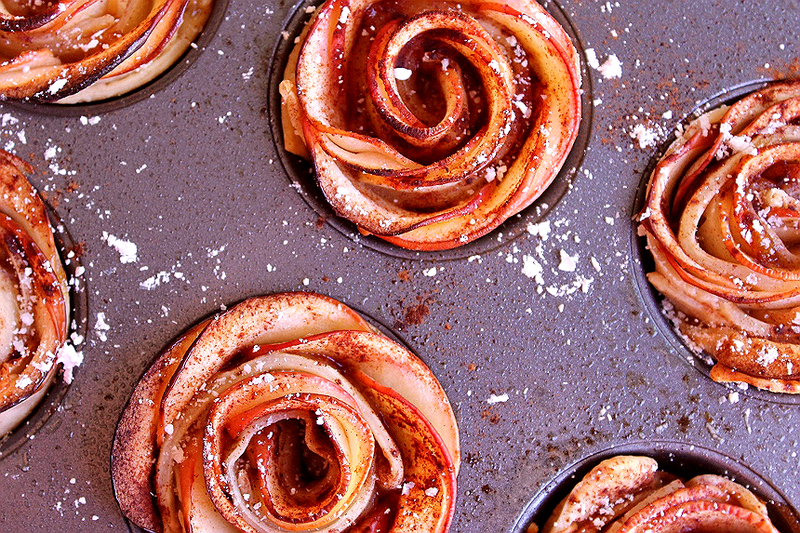 Place Apple Roses in a silicone muffin mold or greased muffin pan. 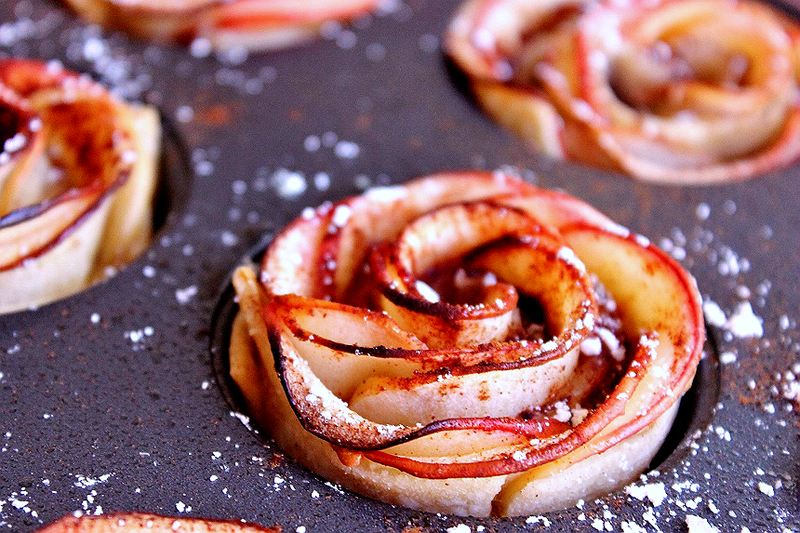 Bake Apple Roses in a preheated, 375F, oven for 25-28 minutes, or until edges begin to turn golden brown. Enjoy fresh from the oven, or chilled. Those apple roses are amazing! I can't believe you made them just from plain old apples. This totally looks like a breakfast that would be perfect for entertaining! Oh my gosh this looks amazing! I can never slice apples that well. 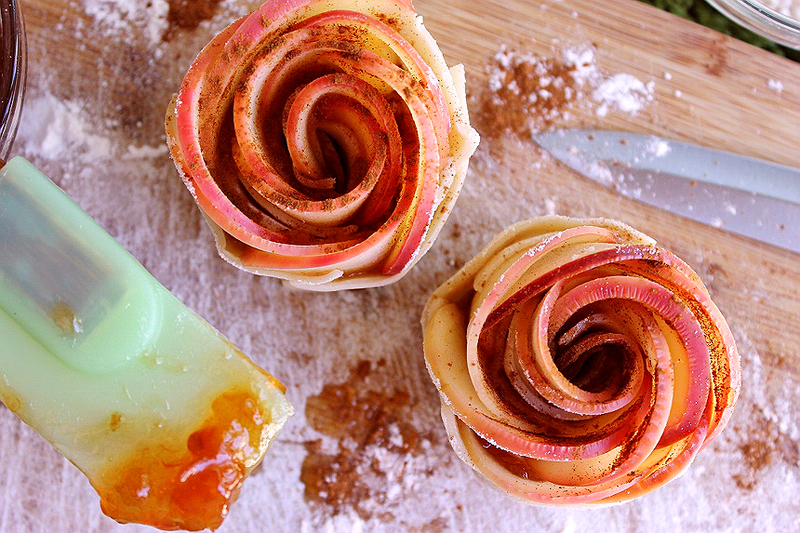 These would apple roses would be perfect to serve at a brunch. Wow that looks amazing! My daughter would love this oatmeal and what a great idea to use milk instead of water. The apples are beautiful! It's almost too pretty to eat! These look too pretty to eat.... but don't worry I could put a dozen away. Hehe. These turned out so beautiful! I bet they are so tasty. I was able to try the Medleys and really liked how fast they are to make in the mornings. Those apple roses are just darling! These are too pretty to eat. I bet they are as good as they look. I need to try this. I'm sure it would! I was thinking of doing something with potatoes and bacon very similar! The roses are just beautiful. I think that maybe a oatmeal and nuts would be good. I think Rachel's on to something with potatoes. Some garlic butter and a hint of cheese. I'm going to have to get me some puff pastry dough. Yeah, Maybe you should try it with potatoes. Would it be hard? Jenna, I know I say this often but this is one of your most lovely posts. The photography is insane. 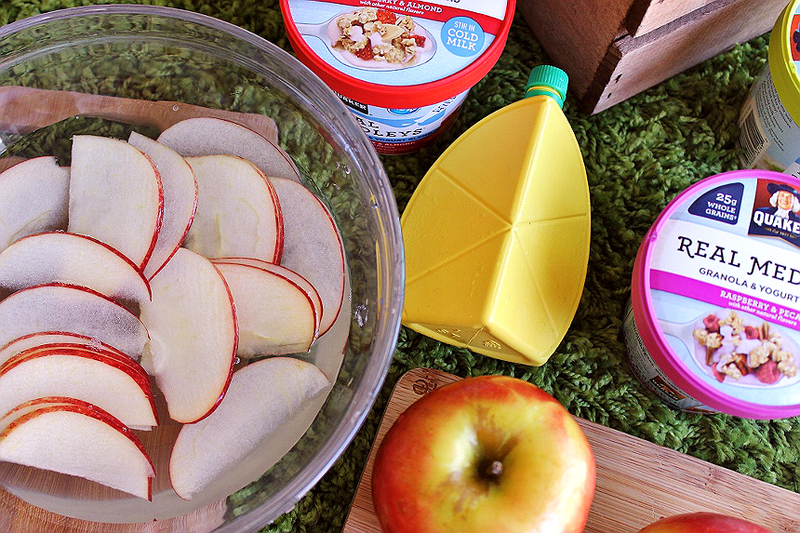 Love the combo of the apples with the Yogurt. Oh that's pretty! I always wondered how they made the roses! Those look SO pretty. I want to try and make them at some point :). And agreed with Shelley, the photos are awesome here! I have not tried the Quaker Real Medleys yet but they sound intriguing so I want to give them a try. Thanks for sharing the apple recipe as this would be fun to try. These look so delicious! I can't wait to try this recipe at home! OMGosh! These are super duper cute and would be perfect for a party. Who would think breakfast could be so beautiful? I'm amazed at your creativity always! I still need to try the Real Medleys, they sound deee-lish. I am so making these for the girls before school. Love these to-go oatmeals too. Must go stock up! I've seen these apple roses and thought they were too difficult to make. Your tutorial is great and I think this is something I can do. Love it.